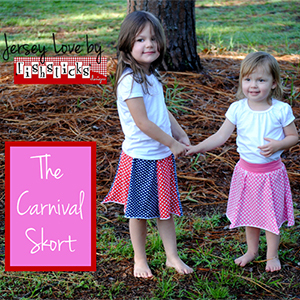 Whether her day brings a ride on the carousel, ring tossing on the midway or a cotton candy treat, the Carnival Skort will keep her feeling comfortable and looking stylish! 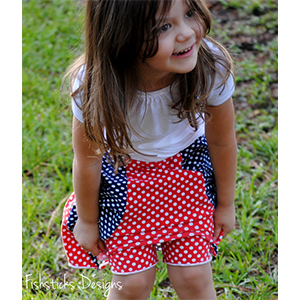 Little girls will be sure to love the playfulness of this skort while moms will appreciate both its style and its modesty. 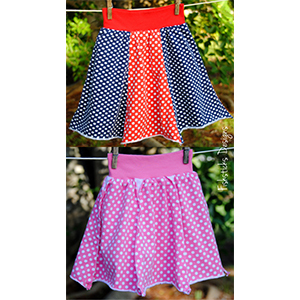 The panels can be sewn with exposed raw edges or hidden raw edges, giving you two looks in one pattern. 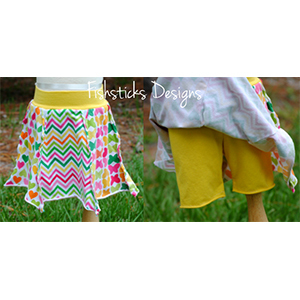 Both options are sewn with a raw edge hem that takes advantage of that great curl that you get when sewing with jersey knits! Recommended fabrics are cotton or cotton blend jerseys with cotton/spandex or cotton/lycra jersey or rib knit for waistband.